From pond and waterfall design to installation, we will work with you in transforming your yard into a natural oasis from start to finish. We offer a variety of services, such as scheduled maintenance, repairs, spring and fall clean-outs, water treatments and water feature accessories. Explore the services we offer and contact your local Certified Aquascape Contractor today at (636) 223-2330. Whatever size water feature you’re looking for, we will work with you to create a scenic escape for your home or business. Your project will begin with a design consultation meeting where, together, we will talk about your water feature options and determine the best fit for your current space. We also can do design consultation work for any do-it-yourself individuals, however, during the consultation we strongly urge that we do the actual installation to ensure the signature look we are known for providing. 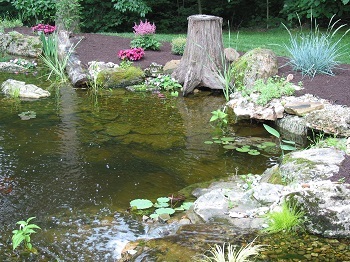 We will perform the entire installation of your water garden from small, medium to large ponds, pondless waterfalls, streams and more. As a Master Certified Aquascape Contractor, Nature’s Re-Creations creates water features that meet Aquascape's requirements for the highest level of quality, design and configuration. We service all of our own features to our existing customers to guarantee their pond will be kept looking the way it was intended year after year. We provide you with beneficial bacteria and any other necessary products to get you ready for a new season of water gardening. We even provide routine maintenance for clients who wish to be more hands off or have too busy of a lifestyle to dedicate enough time to take care of their pond properly. We offer repairs to any of our work when needed. When it comes to working on someone else's problems we tend to shy away. We can sometimes repair certain aspects of existing features such as leaks and other small things but cannot assume liability for someone else’s work. The reason being is that most (99%) of the ponds and waterfalls we get called out to "repair" are constructed wrong from the ground up, we almost always end up doing a re-do on the system instead of a repair, that way we can guarantee our work and the customer gets a brand new properly installed system. I always use the analogy of a roofer, the roofer will put the roof on your house but if the framer did not build a single solid or square wall how can the roofer guarantee his job. Most projects need to be started right from the ground up, that's exactly what we can do for you. Ponds done right the first time, GUARANTEED!